Escape to the Extraordinary in the Southwest! This beautiful high-desert sanctuary is designed for you to deepen your connection with the land. 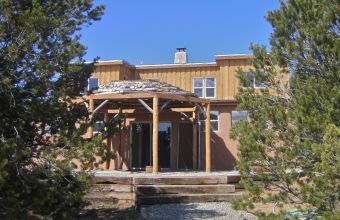 Vista Verde Retreat is a sanctuary in the rural high desert forest of northern New Mexico. This beautiful abode is tucked away in old-growth juniper and piñon pines. If you like being in nature but prefer not to rough it, this place is for you. 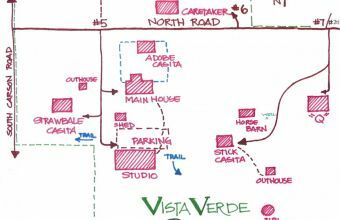 Vista Verde Retreat promotes creativity as well as spirituality. The lodging accommodates 15 - 25. 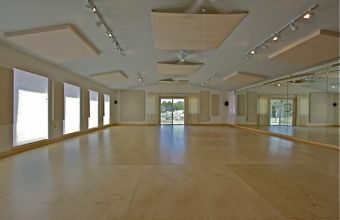 The Studio, a beautiful 37' x 27' space, complete with sprung floor, is ideal for many types of creative and/or healing workshops. Outside, a sense of serenity is pervasive as you wind your way through the 55-acre compound. This is a wonderful place to host your retreat. Near the Studio, the Main House is about 1800 square feet. It has a fully stocked kitchen, a dining room which seats 14-18, and 2 outdoor sitting areas & outdoor dining pavilion, a kiva-style living room, and 3 bedrooms, (2 king beds, 1 queen bed, and 3 twin beds), 1 full bath, and 1 half bath. Four "casitas", (little houses), are located a short distance away: The Straw Bale Casita has a queen bed, a sink and toilet, (the shower is in the Studio). The Adobe Casita has a full bed, no indoor plumbing, but it's only 50 steps away from The Main House. The third casita, the Stick Casita, has one bedroom with 2 twin beds and another twin bed in the living room, and a full bathroom. The Green Hut is about 20 steps from the Main House and has 1 twin bed, but no electricity or plumbing. Last is "The Q", a 1200 sf adobe house with a full bath and full kitchen. It sleeps 4-7; it has an open floor plan with a sleeping alcove. (There are no actual bedrooms.) The 2 Tipis and 3 tents sleep 2-3 each, (seasonal). TheTipis can be used for ceremony as well. They are not water-proof but mold-proof. The ground inside is coarse sand. There is a total of 16 beds. Maximum occupancy is 25. Amenities include a professional sound system for dance/movement in the Studio, flatscreen & DVD player, hi-speed internet, and standard sound systems with CD player & MP3 jacks in both the Main House and The Q. Outdoors it's magical. The surrounding landscape is natural, with big old pine trees, plenty of sweet-smelling sage, and sandy soil. There are 2 loop trails on the 55-acres, which take about a half-hour to walk. Three miles of dirt roads to the retreat center are passable year-round. A 4-wheel drive vehicle is recommended in the snow and mud. 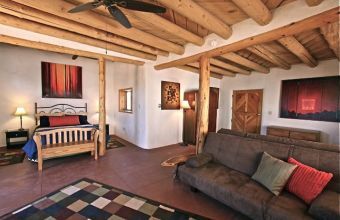 Additionally, outdoor activities within a 30-minute drive such as Ojo Caliente Spa & Mineral Springs with its wonderful waters and old native trails, or wading, rafting, hiking, and horseback riding in the nearby Rio Grande del Norte National Monument might be wonderful additions to your retreat. 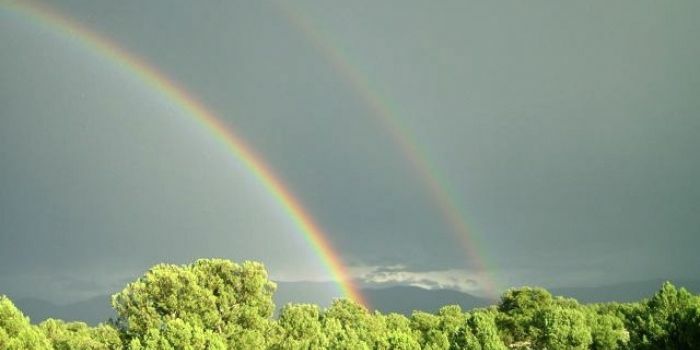 Designed for you to connect with the land, connect with your spirit, and connect with your heart, Vista Verde Retreat Center is a magical place for you to facilitate your vision. Also, we are currently expanding to provide more accommodations, and individual creative spaces for art and writing, as well as boarding for horses. Ive had 4 inquiries in the past 7 days, something Great is happening with your site ........ Just wanted to let you know about the increased activity ......yippee !!! Just had a look at your new site. HOLY COW it's simply gorgeous.BIG congratulations to you...!! !